So, after removing the carpet, painting, repainting and many projects to take the focus off the half wall, we finally decided to just take the wall down, thanks to these reclaimed spindles hubby found. Here are the 3 redos that this staircase has seen all in an attempt to take the focus away from the half wall. The carpeted stairs are the way they looked originally. And here's how they looked the day before the project started. I have to admit, this project was scary. I've never done anything like this and to get the wall out, we first had to have a light switch moved and then we didn't have the right tools to get it out. But oh my, how I would do it all over again because here is how it looks now and I could NOT be happier! Our staircase finally has the railing it deserves. 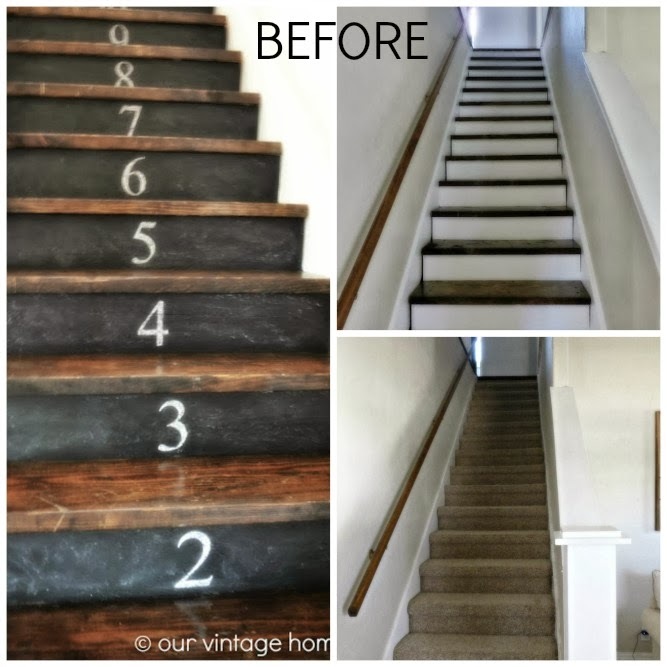 The stairs were painted with Annie Sloan chalkpaint in French Linen. 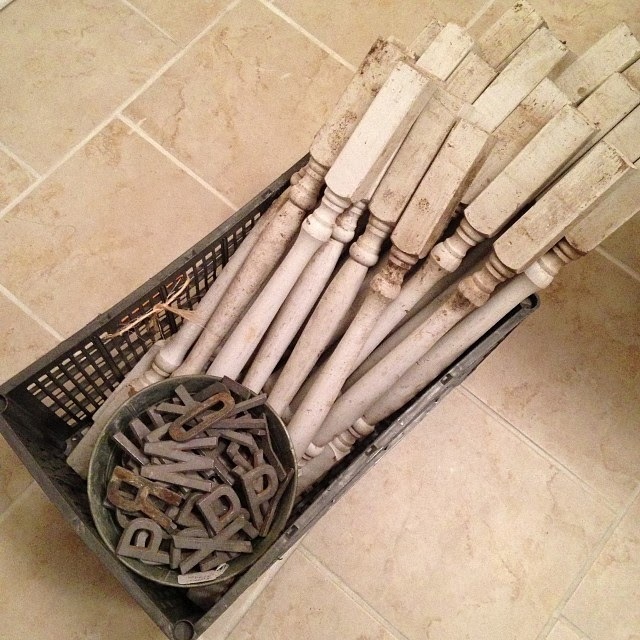 I distressed them and then dry brushed a little white paint on top to age them a bit. We have a dog and kids so they will get distressed anyway and this was a great solution for us if they were going to be painted. The more distressed they get, the better as far as I'm concerned. And as usual, this is causing a room makeover for this room (the den) because I love the railing so much that now I don't have to hide the furniture that isn't my favorite in this room anymore. I would LOVE to remove the carpet in here as most of it is hardwood floor, however, the large section right in front of the stairs is plywood as they used some flooring to repair in other parts of the house. Any suggestions on what to do with the plywood area? Throw a rug over it? Hello! It seems that most of the US is experiencing bitterly cold temps right now, including us as we wait for the "polar vortex" to hit our neck of the woods Sunday and Monday. I don't know about you but I'm a little tired of the cold weather and it is only early January. We still have a couple of months at least of winter. Ugh. But on the positive side, cold weather is the best time to eat and cook one of our favorite foods; soups and stews of all kinds. This one is amazing if you like bacon and cheese and really, who doesn't. Cook bacon in a large pot over medium heat until crisp and fat is rendered. Transfer to paper towel with slotted spoon. Add celery, onion, garlic and thyme to bacon fat and cook until soft. Add half of the beer and cook until reduced by half. Add broth and bring to a simmer. In a small skillet melt butter and then add the flour. Cook, stirring this until slightly browned, about 2 minutes, and then add to soup. Whisk until incorporated and continue to simmer until thickened. Add the cheeses and the rest of the beer and simmer until thick and creamy. Stir in the bacon and salt and pepper to taste. Serve it up with some crusty bread. There really is nothing like a pot of homemade soup simmering on the stove on a cold day, right?